Hello again, it has been sometime since I've updated. The reason why being, me going back to Penang for bloody assignments and some work presentation. Over at Penang, I've finally tried another burger joint that I failed to do so few months back. However, I will not be posting about that for now as I'll be focusing on a new burger joint that was open for about 3 weeks now. It all started few days back where me and Pig decided to have burger for supper. 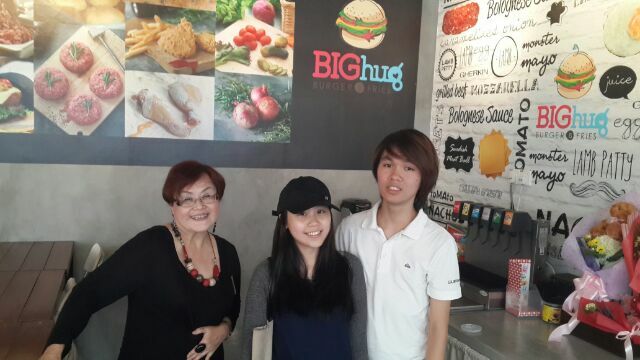 In this case, we thought that the only burger that we've not tried around Subang/Sunway was Big Hug Burger. Everyone was telling us to go and try it out, it was good. So yeah.. at last, we went to Big Hug Burger last Thursday, around 10pm, right before our Star Trek movie. When we arrived, we were greeted by one of the owners (wife) (the 2 owners are husband and wife) saying "Sorry, we're all sold out, everything, including the side dishes". My first reactions was, what in Neptune is this? However, we continue looking at the menu thinking of what we could order the next time. While doing so, the other owner (husband), came and gave his name card to us. We chatted for awhile, talking about the restaurant's menu, quality ingredients, ideas and concept of the place. 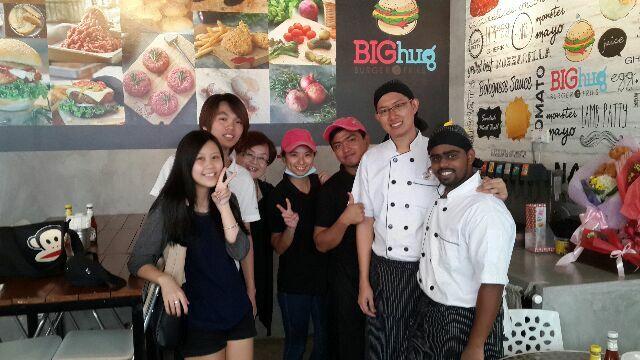 The reason why it was named "Big Hug Burger" was simply because they wanted to share the love and passion for good food. Additionally, they wanted customers to feel like they were at home. That was one of the reason why when the second we opened that door, the smell of burgers overflows the atmosphere. It wasn't a bad thing, although I believe a little ventilation would be good. As people say, hugs are free. It doesn't cost even a penny and it is one of the only gestures that could break all barriers between 2 individuals. 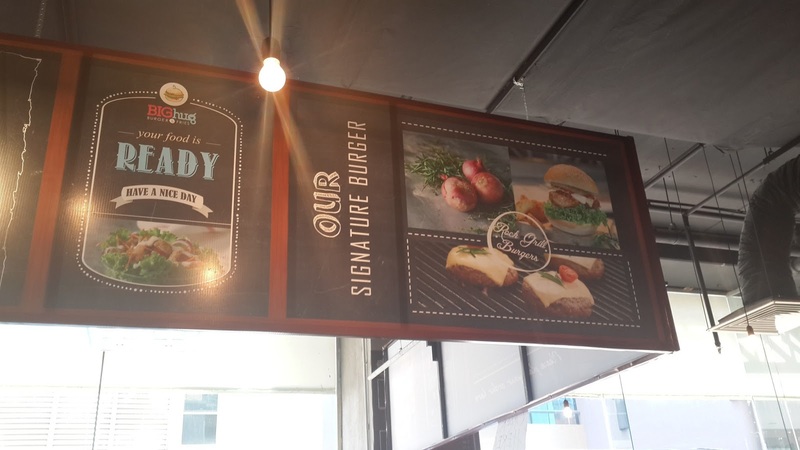 The owners wanted the customers to have a healthy and wholesome meal as well, much like what you would eat when you're at home. In conclusion, both the owners are dedicated to provide the very best in quality of ingredients, taste and service. All the ingredients are freshly picked daily. The head chef's (they call him master-chef) family owns an organic farm which produce most of the restaurant's fresh ingredients. The beef is 100% Australian beef, onions imported from Netherlands and sauce made in house. Everything is done from scratch, right in front of your very eyes. Employees and chefs stay till late at night, just to produce enough ingredients for the next day. This includes the marinating on cherry tomatoes, slicing of chicken and preparation of beef patties. Anywho, since we've failed to eat on Thursday, we told the owner we'll be back next week, after my Penang trip. 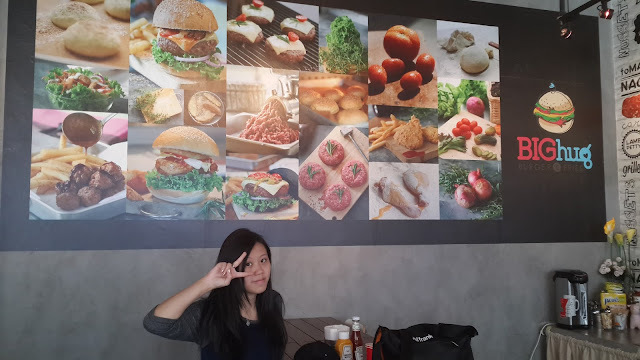 So here we are again, at Big Hug Burger, just yesterday. The owner promised us that she would provide our food for free, but we really did feel quite guilty accepting it. She insisted and requested that we take it as a blessing. It was a blessing indeed. 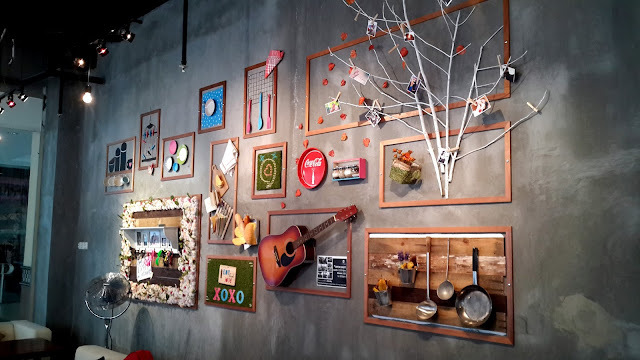 Loved the interior decoration. The floor was just plain concrete, nothing too fancy. Tables and chairs were mainly made from timber. 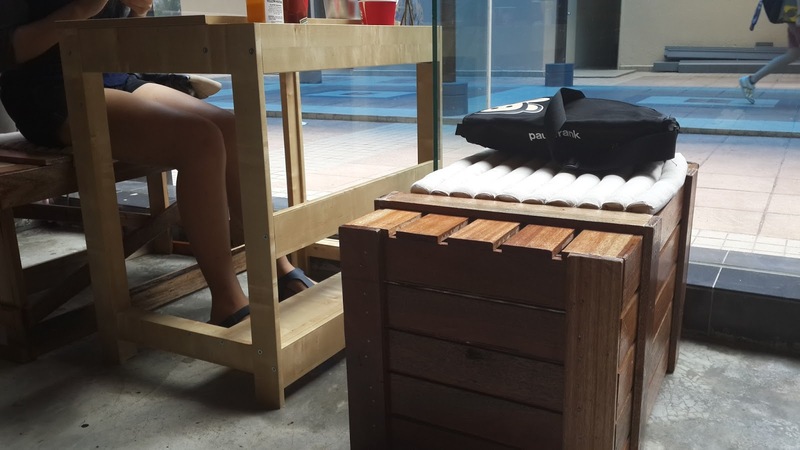 The use of crates as chairs was brilliant. Wall decoration was also rather nice. We were the first customer to order on that day, at 12pm. I ordered the Grilled Salmon Burger, which was priced reasonably. 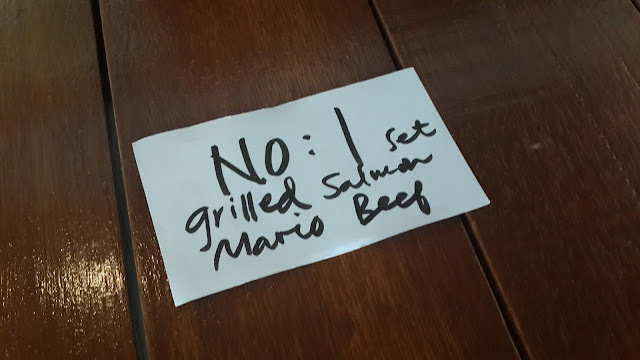 This was one of many burger joints that serves salmon. My first bite.....heaven. The salmon was really soft, tender and fresh. I could feel the salmon falling apart really nicely. That added sweetness that wraps the salmon gave it added flavour. Cheese was melted delightfully on top of the salmon, somehow holding it together. Fresh cherry tomatoes marinated with herbs gave the it a slight tangy kick as well. Caramelized onions and green lettuce to balanced the overall flavour. 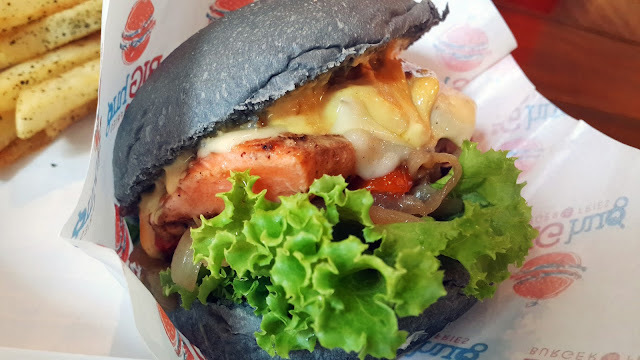 Charcoal buns were able to sustain all the flavours and juices from the burger. The burger tasted really light, but flavourful, which I believe, is rather hard to achieve. Regular burgers require to be really greasy and oily to produce flavours. Conclusion? Fantastic. Highly recommended, 8.5/10. This was Pig's order. The first bite I had, I could taste the freshness and flavours of the mushrooms. Surprisingly, it wasn't oily like a few of the other burger's I've tried. Its as if it was steamed or some sort. 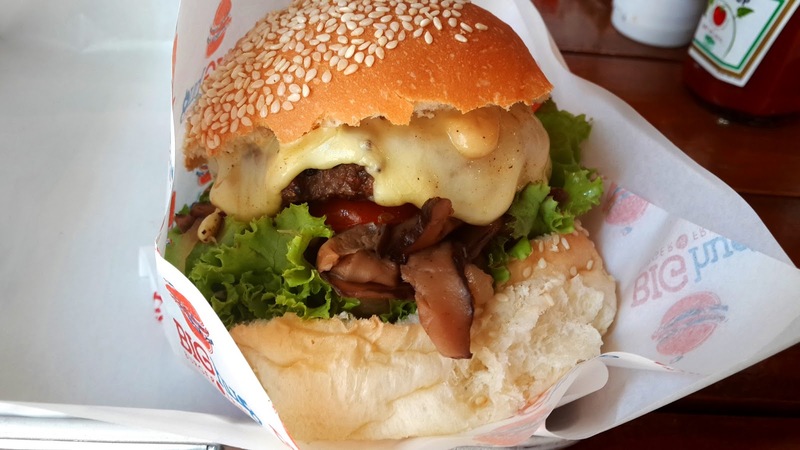 Both Mozarella and Cheddar cheese was used in the making of this burger. The beef patty was really tender and juicy. Best of all, it wasn't greasy! Truly felt healthier after eating this. Like my Grilled Salmon Burger, marinated cherry tomatoes and green lettuce was fresh and crisp. The sesame bun smells really good; it was also really soft but most importantly, able to hold the burger together. Loved it. Highly recommended, 8/10. The onion rings was crispy, light and not really greasy. Onion rings normally are pretty hard to chew. That is because the onions were literally cut in a ring shape. 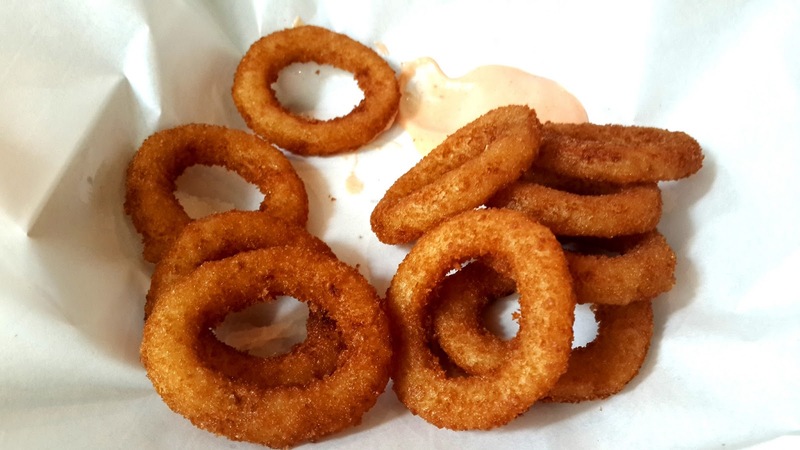 Unlike the onions rings here, its chopped onions shaped in rings, making it easier to bite. The onions could be tasted, which was really good. Recommended, 8/10. Surprised? So am I. 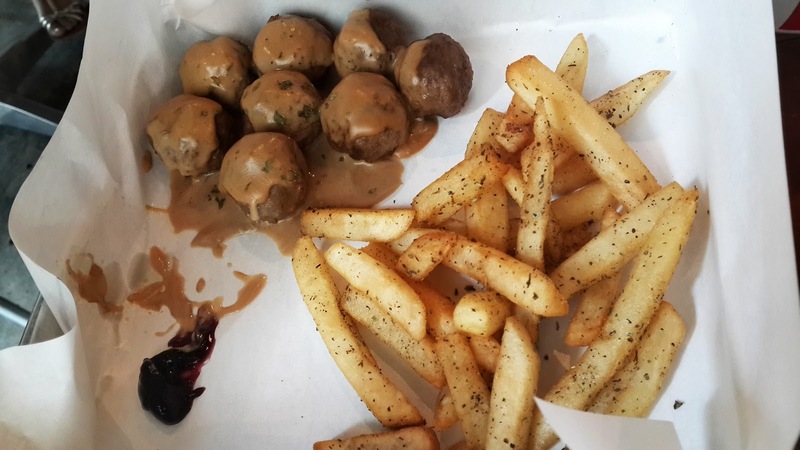 Big Hug Burger sells Swedish meatballs, similar to what you get in Ikea. As you know, Ikea is famous for their meatballs. 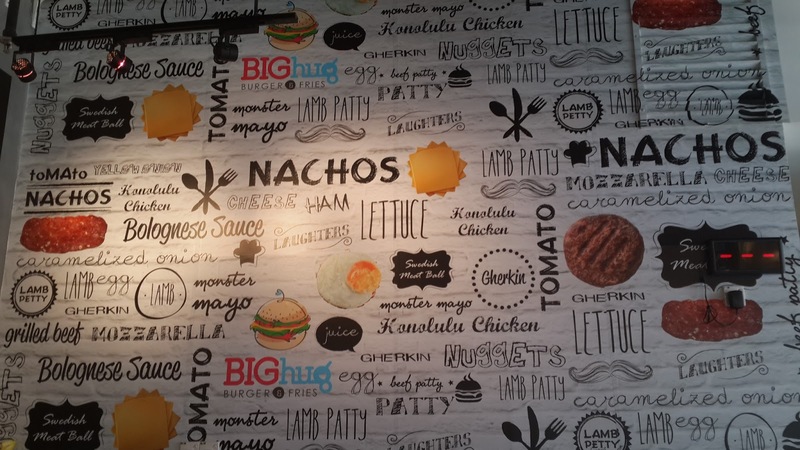 However, what you get in Big Hug Burger is slightly different. The meatballs are made with 100% Australian beef, giving it the quality and taste it needs. The meatballs were really tender and soft, unlike what you get in Ikea. Furthermore, it wasn't even greasy! The sauce was light, but creamy and flavourful. Delightful! Not to mention, its priced similar to Ikea's meatballs. Highly recommended, 8.7/10. The fries was not salty. There wasn't much salt I could find on each stick of fries. The good thing however, it is replaced with herbs instead. Fries was cook nicely, herbs went well with less-salted fries, really good. I believe that fries shouldn't be so salty is because of sauces. Fries could go with almost every kind of sauce possible. Making it a very flexible dish. Top left, Nacho sauce. Regular cheese sauce, Love it on fries! 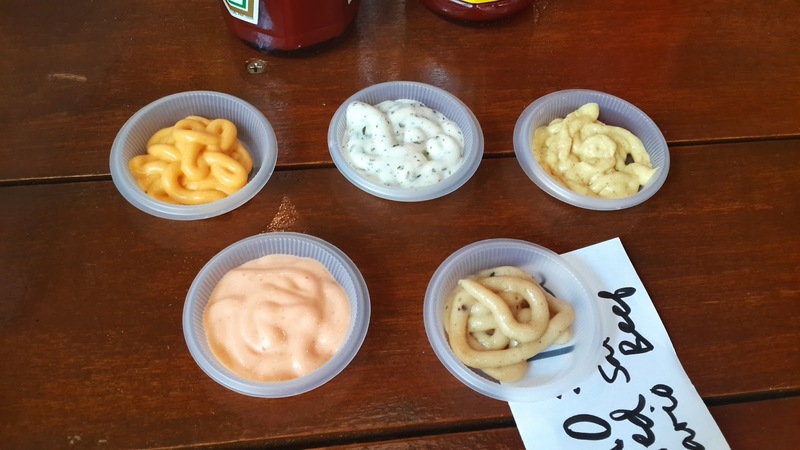 Top right, Monster Mayo. Tasted a bit like what you get in a Chicken flavour Twisties. Unique, there aren't many sauce that would taste like that. Bottom left, Pink Lady. Spicy mayo-like sauce. Another great sauce for fries! Bottom right, Garlic sauce. Garlic bread? Nahh..Garlic fries! Aidelle, one of the owners, served us with local coffee and tea. It was really surprising as I wasn't expecting anything. I did tell her I wanted to try the local coffee, but forgotten on that day because the food was really good. 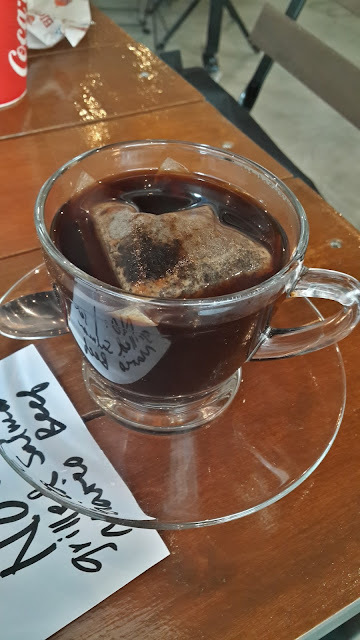 Anyhow, the coffee taste really smooth and rich, barely and sourness. A good blend without sugar or milk. 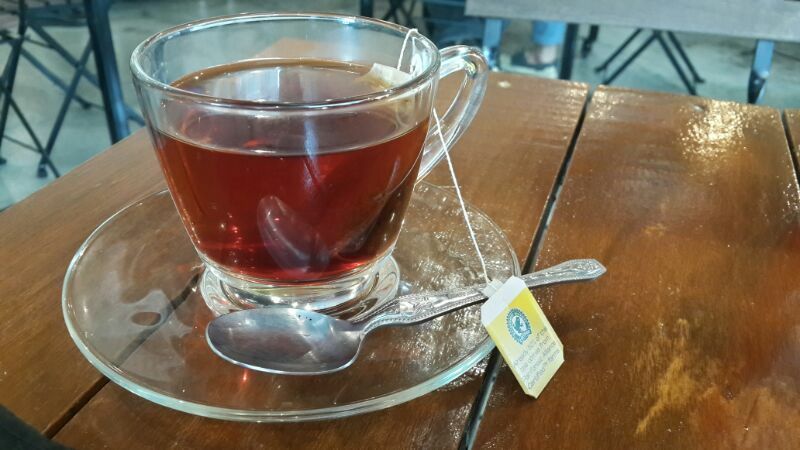 Tea was regular Lipton Tea, but somehow was smoother than usual. Fascinating. Finally, after spending almost 3 hours, we've concluded our meeting. I asked if we could take a photo before I leave and they gladly did. On the first picture my eyes looked really dead was because the person holding the camera was taking quite a long time to take the photo, and I can't smile that long, neither can my eyes hold up. So yeah, it was a great experience, both eating and talking to the owners, Aidelle and Terryson. Wish you guys all the best and continue the good food! Daily 12.30 - 4 pm, 6.30 - 10.30pm. LOL I've been living in SS15 for many years now and I have not came across this shop! Thanks for the info will try out the place some day:) looks great.